If you have been injured in an accident involving a tractor-trailer, you urgently need our experienced Lancaster accident attorneys on your side. Large trucks operate differently on the road from passenger vehicles. They are subject to different inspection and maintenance requirements, and their drivers are subject to more and different regulations and restrictions from ordinary drivers. Expert testimony is often necessary to establish what the driver did wrong. Because of their sheer size, when tractor-trailers are involved in crashes they often result in severe injuries or death. 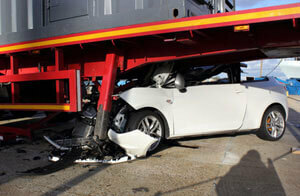 Injury claims from such accidents are some of the largest claims we encounter, and trucking companies know it. They are often represented by the largest and most aggressive insurance companies, often with millions of dollars at stake. We have the experience of litigating cases of serious injury and wrongful death stemming from tractor-trailer accidents. We have worked frequently with the experts in the field, and we have stood up time and again to the major insurance carriers who cover trucking companies. With our legal team on your side, you and your family can rest assured that your rights are being defended by a firm with the skills and experience necessary when huge claims and very large dollar amounts are on the line.